As a long time villain in the Bat-world, Poison Ivy hasn't always gotten her due. She's often overlooked with some of the crazier rogues taking the spotlight and with the popularity of Harley Quinn, Dr. Pamela Isley may be living in her shadow. Thankfully, DC Comics saw her value enough to release a limited series with Amy Chu and Clay Mann that reintroduces her to fans. And yes, Harley makes an appearance. 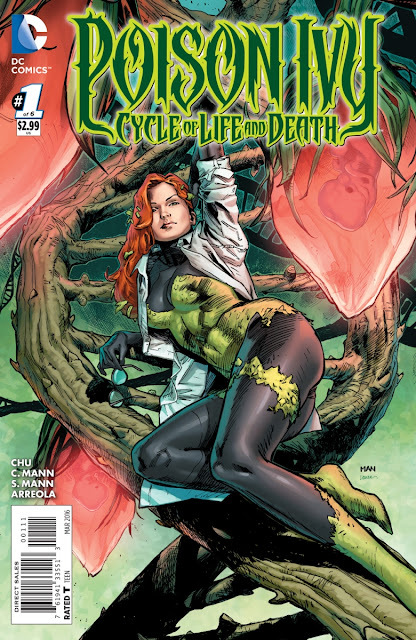 'Poison Ivy: Cycle of Life and Death' #1 showcases the scientific side of Ivy and her obsession with organic plant life. She harnesses the power of plants, talking to them, making them do her bidding, determined to see them flourish and nourished. She cherishes her solitude, her communing with plants and experiments. It's this love that keeps her at Gotham Botanical Gardens under the mentorship of her colleague Dr. Luisa Cruz. There's a nice surprise visit from the kids of Gotham Academy making a brief cameo. The chemistry with Harley is a little strained. Harley doesn't feel as though Ivy sees her as an equal but they seem perfectly in tune when bashing some unruly patrons in a bar fight. Ultimately, Ivy is happiest alone and with her plants. She hasn't been depicted very well in live-action, portrayed as an over-the-top campy angry nerd villain. She's fared much better in animation where she's smart, snarky, and powerful. Here, Chu conveys Ivy's supreme intelligence, passion, and confidence. All the characteristics you'd hope to find in a worthy villain that you can also admire. Clay Mann does an impeccable job designing every character and scene. Lines are so precise and clean, expressions and body language speak for themselves. The only critique would be the odd angles of perspective at times. It seems like we're getting the first person perspective of a dwarf, looking upwards at other characters or from behind someone's skirt. Seth Mann handles the inking providing much depth where needed and Ulises Arreola's colors give the issue the right vibrancy especially when Ivy and Harley are on the page. 'Poison Ivy: Cycle of Life and Death' #1 is a great start to reestablishing the underrated Poison Ivy as a brilliant and powerful figure capable of emerging from Harley Quinn's shadow. The first issue wisely chooses a character-driven story that leads to an intriguing cliffhanger. Established fans should love this while new readers may want to be patient to see where this mystery goes.